Gefilte Fish is to Jewish Food as ________________ is to American Jewish food. Gefilte Fish is to Jewish Food as Chinese Food on Christmas is to American Jewish food. Eating Chinese food on Christmas is a beloved Jewish American Christmas ritual. During her 2010 confirmation hearing, Justice Elena Kagan’s marshaled this private family tradition into a public Jewish American cultural custom. Some of my favorite memories from growing up Jewish in rural Maine are eating Chinese food on Christmas and Sundays with my parents, brothers and grandparents. 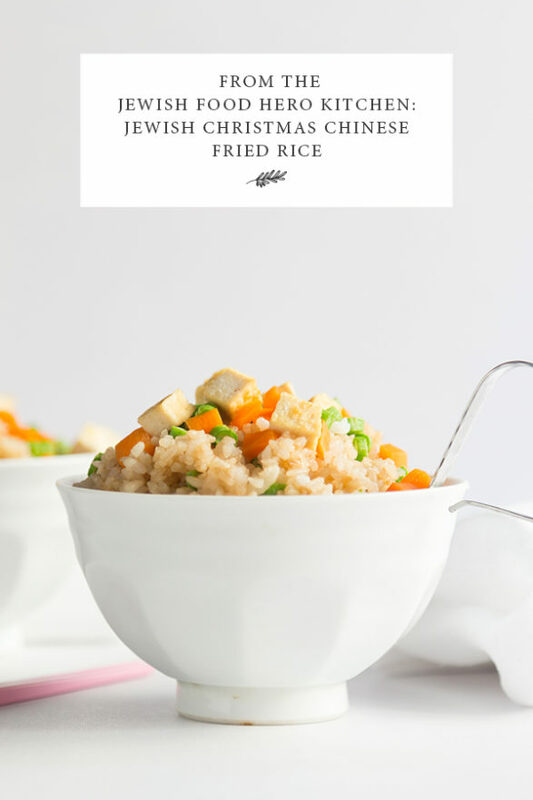 To honor my memory and our tradition, here is a simple, delicious and healthy oil free vegan fried rice with tofu recipe. Enjoy it on Christmas, Sundays or any other weekday. Children love this recipe! Sprinkle 1-2 tsp of vegetable broth of water into the skillet/wok to make sure it is hot. Add tofu and stir regularly, allowing it to brown slightly. Your Turn: Share your favorite Jewish Christmas Chinese food story with us in the comments!